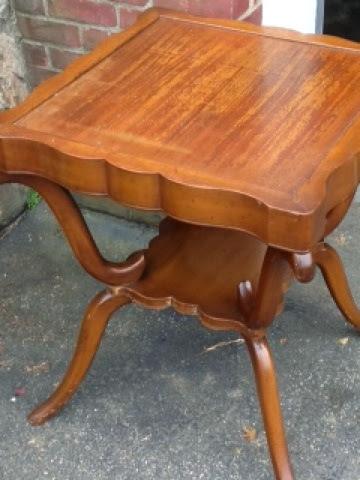 Take a look at this pretty little table someone found for me! Isn’t the shape gorgeous? 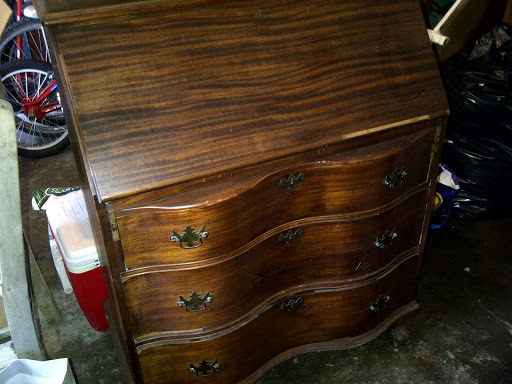 Except for being a little wobbly and some peeling veneer on the top, I knew this piece had a lot of potential. I thought I would do a distressed white with some kind of graphic in the middle. 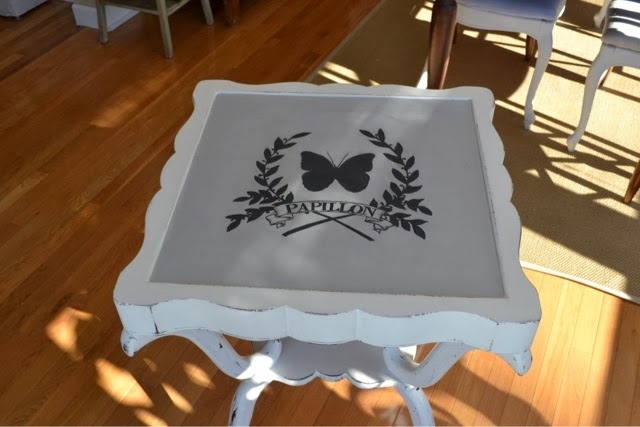 I went to the Graphics Fairy website and downloaded a lovely butterfly graphic with french typography. 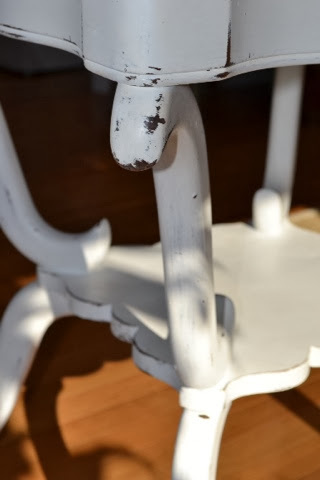 After repairing the veneer and reaffixing the legs better, I went to work on painting it. 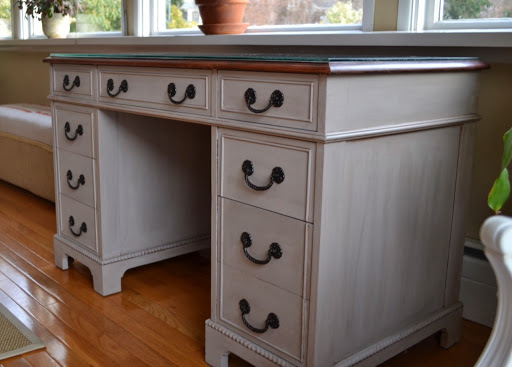 I used my homemade chalk paint recipe for the body. 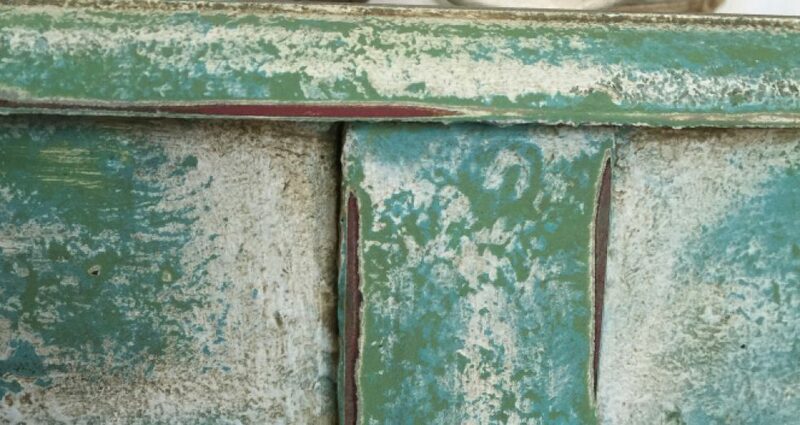 I found some flat ceiling paint I had leftover from another project. Then I distressed the edges. 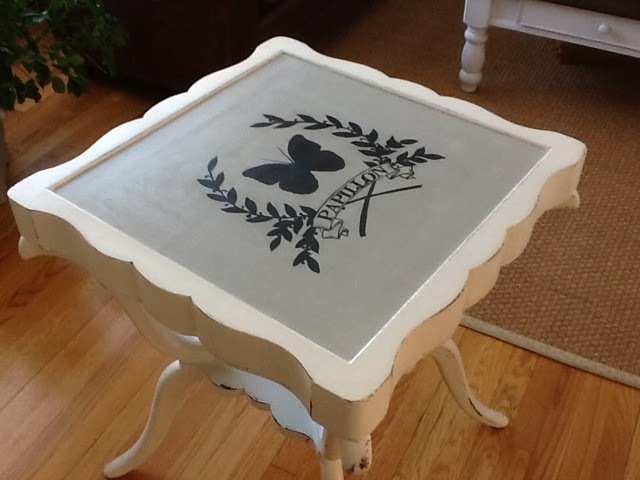 I mixed up some gray chalk paint for the inside square and then used the graphic. After I print out the image/graphic/typography, I use a cray-pas to color over the back of the entire image. Then I turn the image right side up and use a red ballpoint pen to trace the outline of the image on top of wherever I’d like it to go. After you take it off, you get a beautiful reproduction of the outline. Now, is the fun part, the painting. 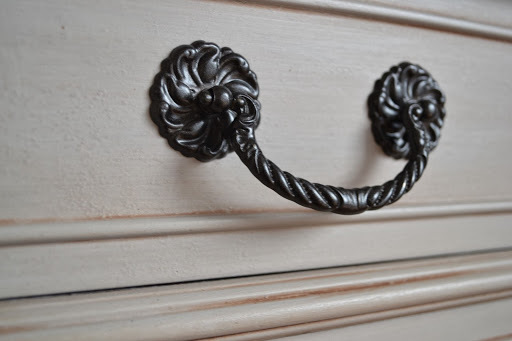 I use acrylic paint watered down or cut with a little floetrol or extender. I used Johson’s Paste Wax to protect it. 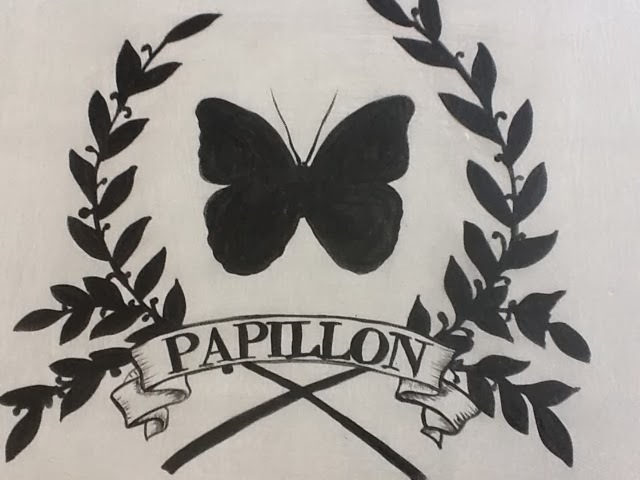 This piece was a mess but it was gorgeous! 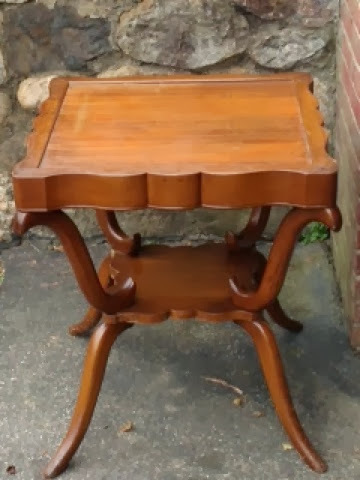 I rescued it from the basement of a home that was being sold. 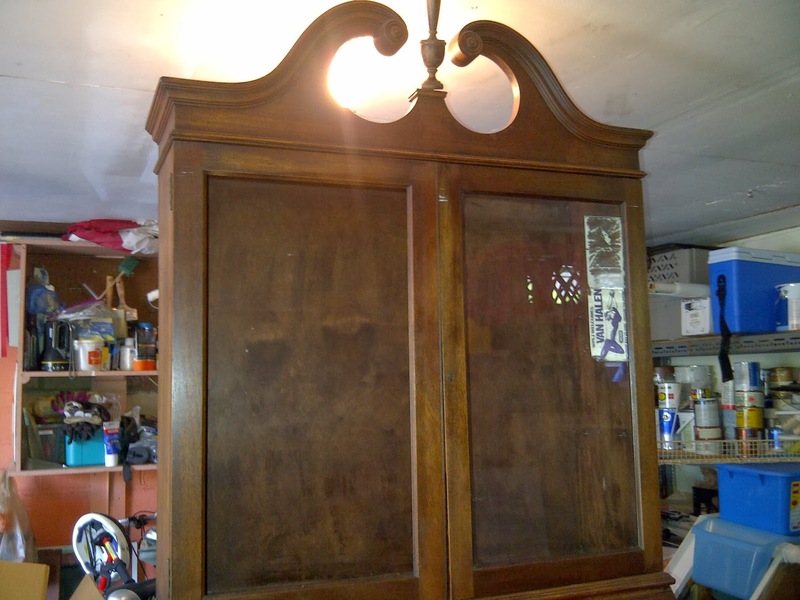 It was missing a piece of glass in one of the doors, the veneer was chipping and peeling off, and one of the drawers was locked and I could not open it for the life of me. My dad and stepmom came to the rescue and sawed off the lock for me! :)) I knew it had potential though, and when I finished I think it came out awesome!I I knocked out the glass, got some chicken wire (poultry netting) inside the doors. Then I went to work…. 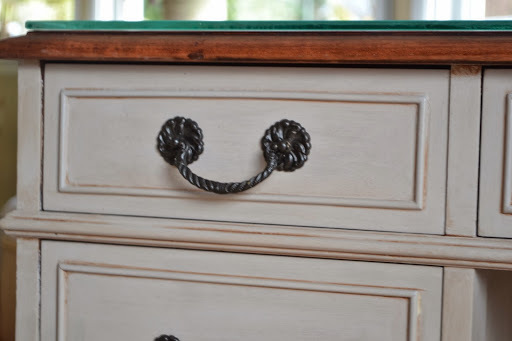 I always mix up my own chalk paint, it’s way cheaper than buying pre made. I can also customize my colors to whatever it is I’m painting. 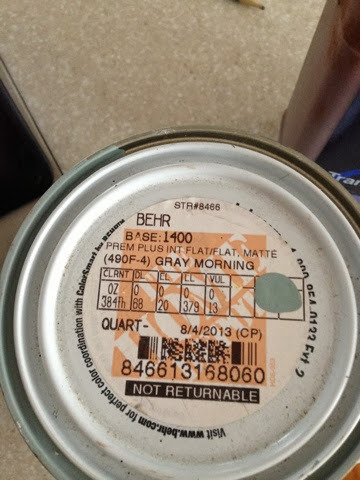 I used Behr’s Gray Morning in a flat matte finish. I mixed a couple of teaspoons of non sanded grout and water in my old blender and then in poured it in to about a cup or two of the paint. Mix it really well, and Voila! 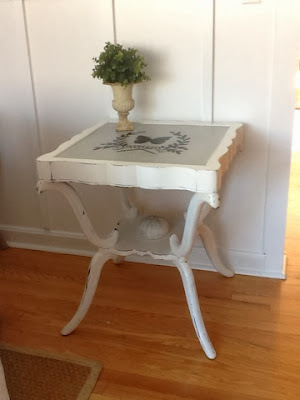 Homemade chalk paint. 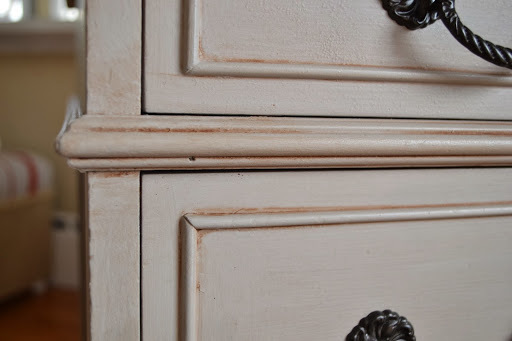 I don’t prime when I’m using chalk paint, it’s not necessary. 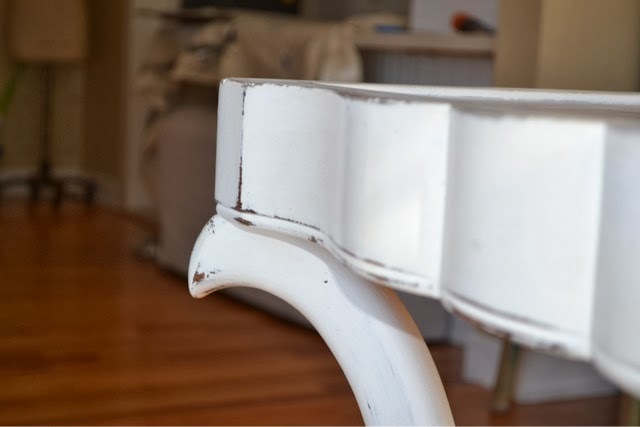 I usually paint 2-3 coats, then I use a sanding sponge to sand the paint. This gives it that nice smooth texture you need for the next steps. The inside I painted another Behr Color, Sparrow. I wanted a little contrast inside but nothing too shocking. 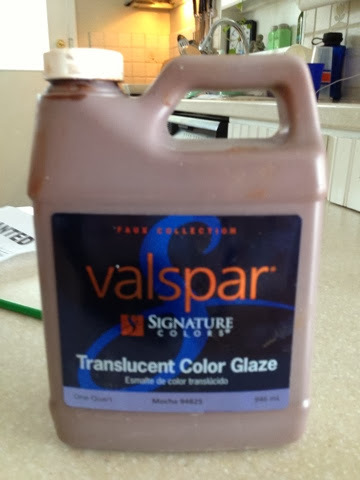 To antique it and give it more worn appearance I brushed on Valspar’s translucent color glaze in Mocha. If you work section by section it makes it much easier. The inside I did not distress or glaze. 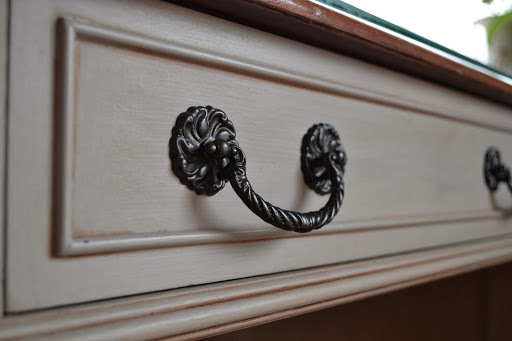 I sprayed the old hardware with Rustoleum’s aged bronze spray paint. I used a can of Briwax I had lying around my garage to give this protection, used my large stippling brush to apply and buffed it out so it gave it a nice sheen. I find that the Briwax is softer than some other paste waxes I’ve used and it makes it easier to apply. 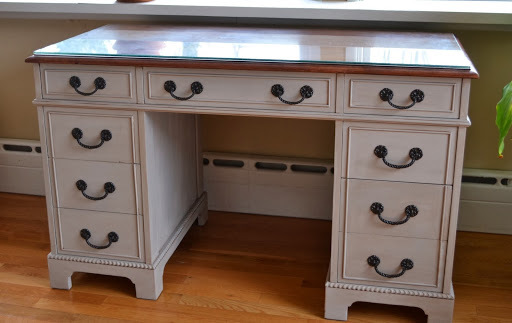 I found this desk not such bad shape, but I knew that I wanted to refinish the top and leave it wood while painting and glazing the body. So, I used a couple of different kinds of stripper to remove the the old varnish, and with a lot of elbow grease finally the layers melted off. 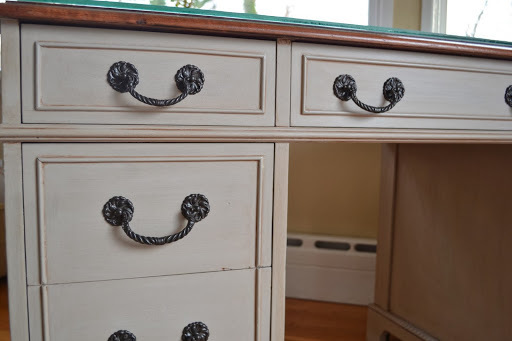 It was missing a little trim on one of the drawers but luckily a chopstick cut on an angle did the trick! 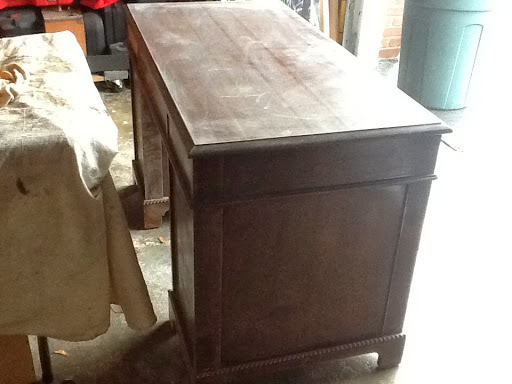 I used 4-5 coats of a mahogany colored furniture wax to seal the top. 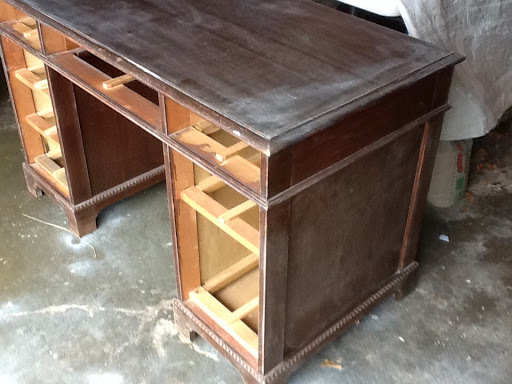 Luckily, the desk came with a thick piece of beveled glass so the top could be protected. 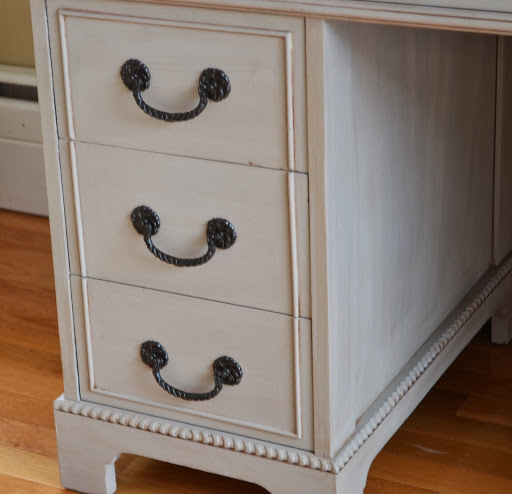 As for the rest of the piece, I mixed up my own chalk paint in a color as close to Annie Sloan’s Paris Gray as I could. 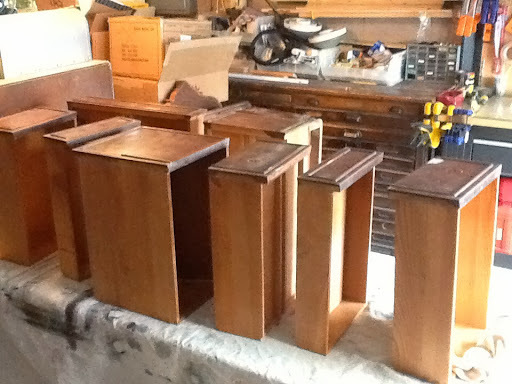 I applied 3-4 coats or so, sanded and then used Valspar’s glazing medium I picked up at Lowe’s. I brushed it on, and then wiped off with a clean damp rag leaving more in the crevices. 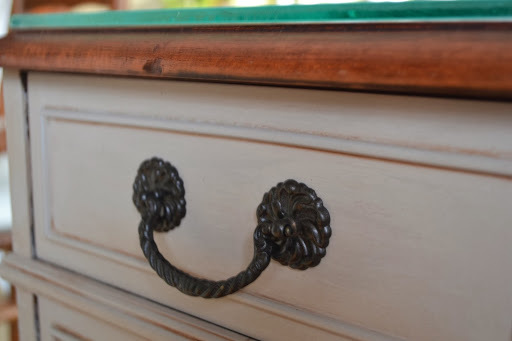 I finished with clear Briwax, brushed on with a big stippling brush I had leftover from my faux finishing days and buffed off. I think it came out fantastic! 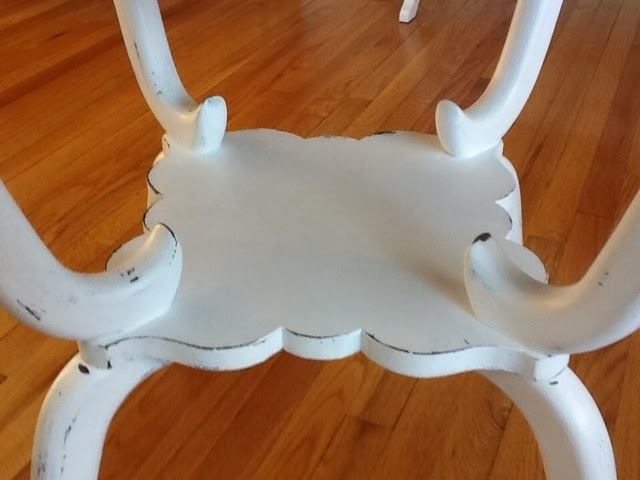 I have a chair that will be done in a day or two and I will post photos. 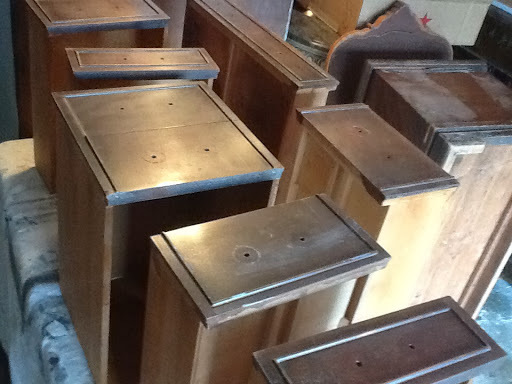 Here is the before and after….